Can you tell we're on jussssssssst a little bit of a lamington kick? We're kind of obsessed with the chocolate coconut combination at the moment and this may just be one of our new favourite recipes. I love raw treats - but the rest of the SIL family aren't exactly converts... well... they weren't. You see, usually I make raw treats and Jesse and Katrina are keen as a bean to try them, but SIL Mama and Papa shy away from my "hippie treats". But not this time. In fact, they even these over the lamington cupcakes. SIL Mama came home and I had two containers on the kitchen bench - one with the Lamington Cupcakes and the other with these raw bites. She looked at the cupcakes, but the raw bites sparked her interest and she took one of those instead. 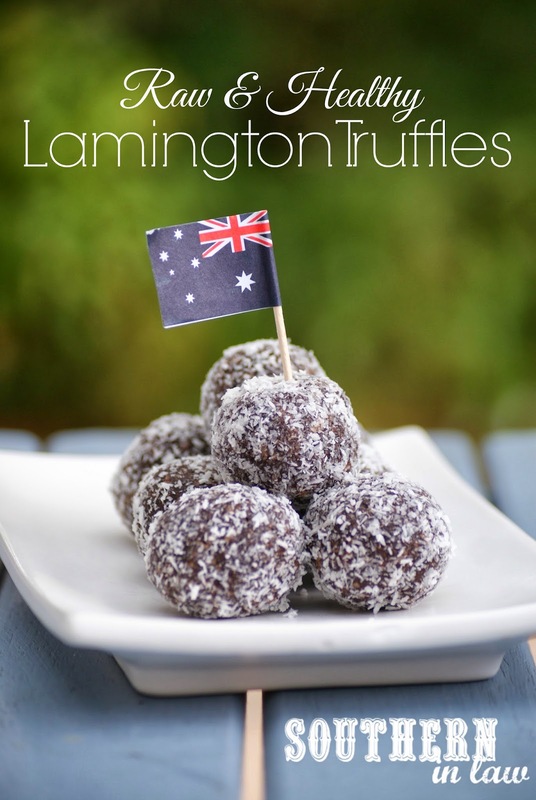 She couldn't quite believe that these Lamington Truffles used just dates, almonds, cocoa, coconut and maple syrup - because they really do taste just like a lamington. After much tweaking and testing and adapting - I even got the texture right. These feel like cake pops or cake truffles - but they're completely healthy and they don't even spend a second in the oven. They're chocolatey, coconutty and ohhhhhhhhhhh so good - I promise they'll be a hit in any chocolate and coconut loving household. 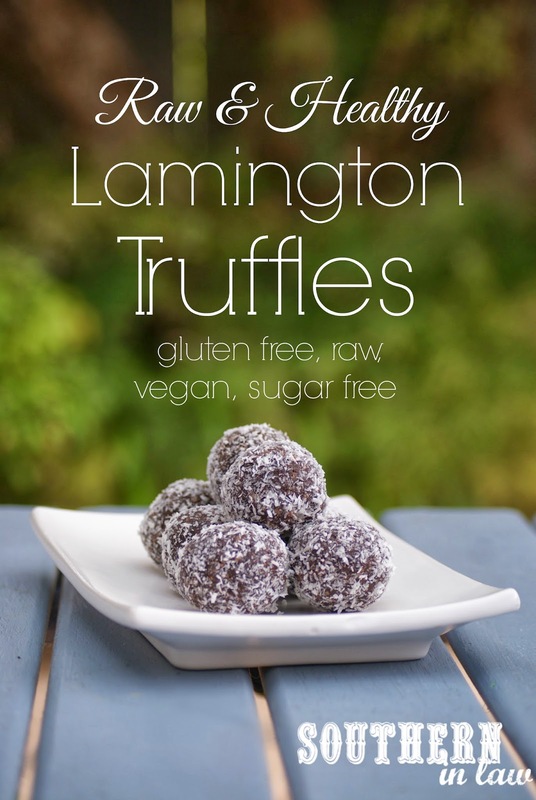 But that said, Jesse isn't usually a coconut fan - but the Healthy Chocolate Crackles, Lamington Cupcakes and these Raw Lamington Bites have totally converted him and he can't get enough! Place your dates in a food processor and process until they are broken up and form a ball. Next, add in your almond meal, 1/2 cup coconut and cocoa powder and process until crumbly. Add in your maple syrup and process until the mixture starts to combine. Next, gradually add in water by teaspoonfuls (we only need 1 tsp) until the mix forms a "dough". Take your food processor bowl out of the machine and measure out heaping tablespoons of mix. Roll into balls and set aside on a plate. Continue until all of your mix is used up. Next, grab a medium ziplock bag or freezer bag and pour in your extra 1/4 cup of coconut. 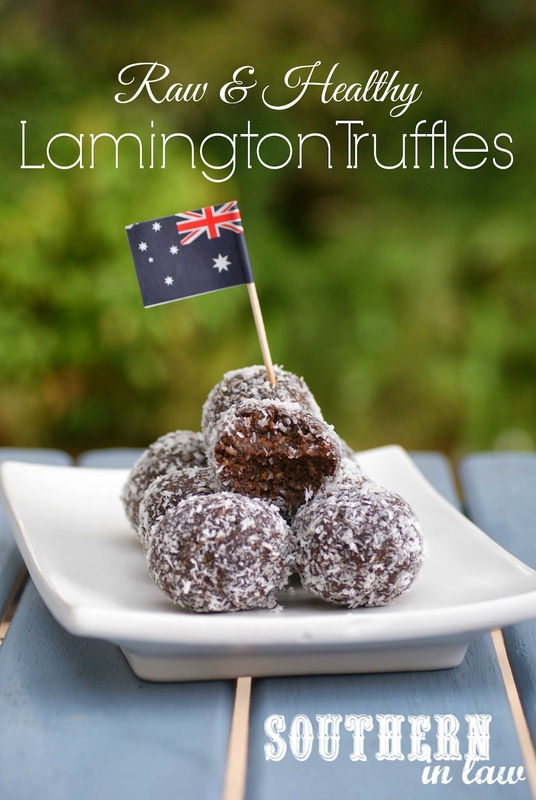 Add your lamington bites to the bag and shake the bag around to evenly coat each of the bites with a layer of coconut. We added about 3 bites to the bag to avoid squishing them. Once all of your bites are covered, place them into an airtight container. The bites will keep at room temperature for quite some time, however, they will last longer if stored in the fridge or freezer (where they will keep indefinitely). But tell me, are you a raw treat fan? What's one thing you love but your family aren't convinced by? My family really aren't convinced that Goat Cheese and Nutella Sandwiches taste good - and I tend to freak them out a bit with my weird food combinations, but it's safe to say they're now aboard the raw treat train!